^ a b Yann LeCun; Yoshua Bengio; Geoffrey Hinton (2015-05-28). “Deep learning”. Nature 521 (7553): 436-444. doi:10.1038/nature14539. ^ Yann LeCun; Leon Bottou; Genevieve B. Orr; Klaus-Robert Muller (1998). Efficient BackProp. http://yann.lecun.com/exdb/publis/pdf/lecun-98b.pdf. ^ a b Xavier Glorot; Yoshua Bengio (2010). Understanding the difficulty of training deep feedforward neural networks. http://jmlr.org/proceedings/papers/v9/glorot10a/glorot10a.pdf. ^ Xavier Glorot; Antoine Bordes; Yoshua Bengio. “Deep Sparse Rectifier Neural Networks”. Proceedings of the Fourteenth International Conference on Artificial Intelligence and Statistics (AISTATS-11) 15: 315-323. http://jmlr.csail.mit.edu/proceedings/papers/v15/glorot11a/glorot11a.pdf. ^ Andrew L. Maas; Awni Y. Hannun; Andrew Y. Ng (2013). Rectifier Nonlinearities Improve Neural Network Acoustic Models. http://web.stanford.edu/~awni/papers/relu_hybrid_icml2013_final.pdf. ^ Youngmin Cho; Lawrence K. Saul (2009). “Kernel Methods for Deep Learning”. Advances in Neural Information Processing Systems 22: 342-350. http://papers.nips.cc/paper/3628-kernel-methods-for-deep-learning.pdf. ^ Broomhead, David S.; Lowe, David (1988). 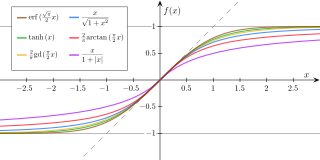 Radial basis functions, multi-variable functional interpolation and adaptive networks. http://www.dtic.mil/cgi-bin/GetTRDoc?AD=ADA196234. ^ Qinghua Zhang; Albert Benveniste (1992). “Wavelet networks”. IEEE Trans. Neural Networks 3: 889-898. http://people.rennes.inria.fr/Albert.Benveniste/pub/Wavenets.pdf. ^ Ian J. Goodfellow; David Warde-Farley; Mehdi Mirza; Aaron Courville; Yoshua Bengio (2013). “Maxout Networks”. 30th International Conference on Machine Learning. http://arxiv.org/abs/1302.4389.